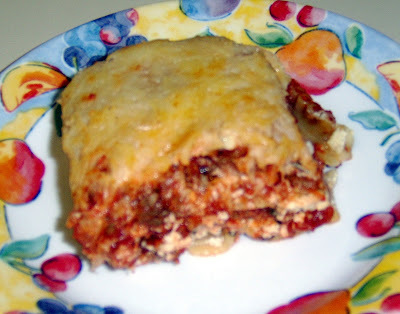 I wanted to make my husband's favorite meal tonight which is Lasagna. Not just any Lasagna but the World's Best Lasagna! I made a few variations to the recipe. I added 1.25 lbs of sweet Italian sausage since that was how much was in the package as well as 1 lb of lean ground beef. Dear husband would probably say the more meat the better. I also added 1 can of Italian diced tomatoes to the meat sauce since we like the chunks of tomatoes in our sauces. I omitted the fennel seeds and I did not add 1 tbsp of salt but only maybe half that amount. I added 1 teaspoon oregano and 2 teaspoons of basil rather than 1/2 teaspoons. I also doubled the ricotta mixture since it did not seem like it was enough for the Lasagna. It turned out great! I can't wait for him to come home this evening from work for a wonderful meal.